this is lazy girl food. it was perfect for a quick lunch while i was working at home earlier in the week – a spicy chorizo sausage finely diced and fried in a dry non-stick pan until it releases its oils and cooks through. a squeeze of lemon juice plus lots of freshly ground black pepper and chopped flat leaf parsley, which is i tossed through with my cooked pasta. lots of parmesan. i’d have added rocket too if i’d had any. it’s not complicated or exciting but it was delicious and is my contribution to this week’s presto past nights, which i am hosting. 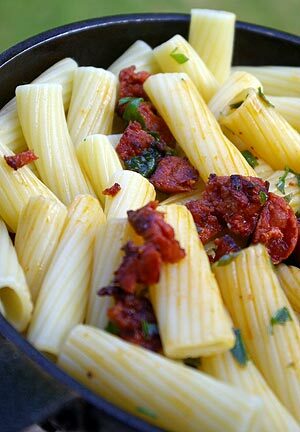 if you have any pasta dishes to share, let me know asap!